One of Milwaukee Sting Volleyball Club's board members shared a spreadsheet that her husband had emailed out to the families in their car pool this past club season. At first glance, I thought it was hysterical that anyone would stat and chart a car pool. But then I looked at the numbers. The carpool saved 11 families over $5,000 in gas and over 100 hours sitting in a gym. Steve Litzau is a "Volley Dad" and the man behind the car pool. Steve has a successful career as an Engineer with Rockwell Automation and plays with friends in a rock 'n roll band. His wife, Kathy is the Senior Associate Athletic Director and former Women's Head Coach of UW-Milwaukee, is on our Milwaukee Sting Board of Directors and Head Coach for our 15 Gold team. 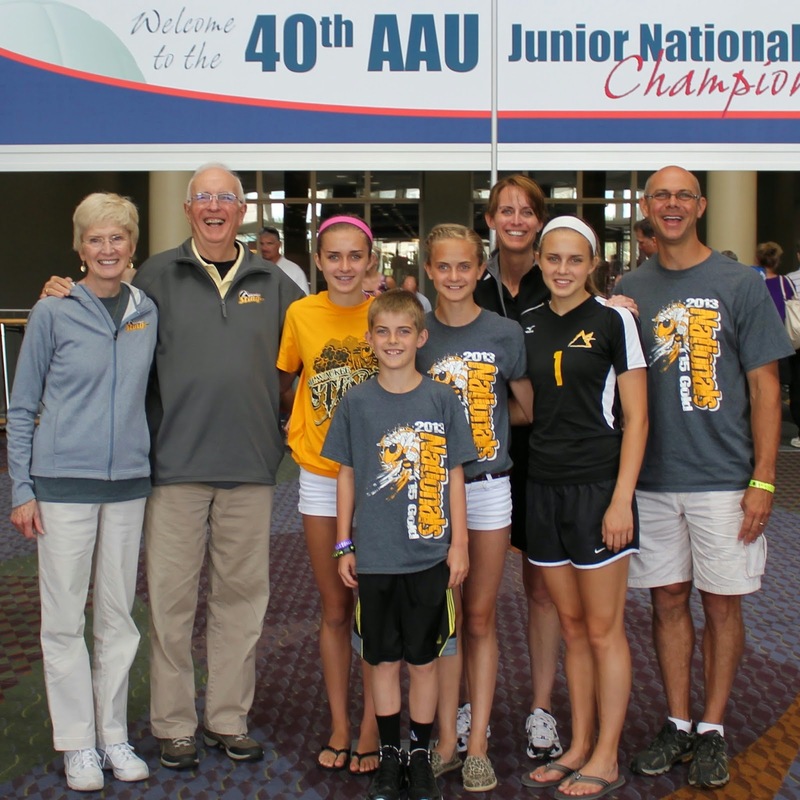 Steve and Kathy have four children: one son and three daughters who play club volleyball. I sat down for lunch with Steve one afternoon to find out more about this volley dad. Steve explained that this is actually the 3rd year of the car pool. As an engineer, designing the detailed spreadsheet he used to assign trips was 2nd nature. Curiosity and a course in statistics led him to track time and money saved. Driving duties were assigned on a percentage, based on the number of trips a family's players would have to travel. Everyone ended up driving 75% less than they would have done on their own. Steve said that communication between the families was crucial. Each family had a contact sheet with each other's contact information. It was helpful that the club posted practice schedules 2-4 weeks in advance. As complicated as it looks, Steve said he only spent about 2 hours a week managing the car pool. Every time I see Steve at a tournament or in the gym, he has a huge friendly smile. I asked Steve how he ended up a volley dad. Not surprisingly, volleyball brought Steve and Kathy together. Steve played in adult leagues while attending the University of Wisconsin and met Kathy (Cunningham) who was the 2nd Assistant under John Cook for the women's team at the time, and they met through league friends. I asked, "Steve, there must be something that you don't like about club volleyball, what is it?" Steve replied: "Honestly, there really isn't anything about club volleyball that I don't like. I love the opportunities it has given my family to share time together doing something so worthwhile. The Litzau's are very competitive and for my wife and children to compete at the level they do is a privilege. We enjoy all the friends we've made and have so much fun with our volleyball friends." So if your families can save money, save time driving to and from practices and sitting in practices, and have more quality time, maybe the car pools will be as fun as the Litzau's. Trips Per Week - This is the total number of trips each family would take for their families practices on a normal week without a tournament on the weekend. Ex - Litzau - Monday - Kayce =1, Tuesday - Lauren & Danielle, usually at different times and locations = 2, Wednesday - Kayce = 1, Thursday - Lauren, Danielle, and Kayce, all at the same time and location = 1, Saturday - Lauren & Danielle, usually at different times and locations = 2, Grand total = 7. Note there is an * (footnote) in front of some families denoting trips not taken into consideration in their total or additional trips taken. 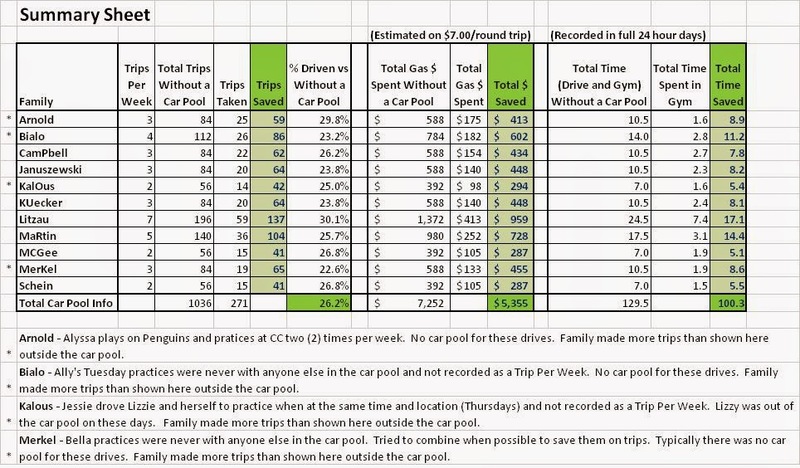 Total Trips Without a Car Pool - Trips/Week x 28 Weeks = Family's trips that would have been taken without car pool. Trips Taken - This is the total number of trips recorded that each family took over the year. A trip was recorded if parent was the only driver that night, or shared the trip with another family and drove more than one family. Trips Saved - Total Trips - Trips Taken = Trips Saved. % Driven vs Without a Car Pool - Trips Taken / Total Trips = % Driven. As a car pool, they only drove 26% of what they would have by themselves! Total $ Saved - Approximately $5000+ saved as a car pool! Estimated gas costs to be ~$7.00 per round trip per car driven. Logic - It's approximately 20 miles each way. Average car gets ~20 miles to the gallon. ~$3.50 per gallon. All gas costs are Trips (as stated above) x $7.00. Total Time Without a Car Pool - Total Trips w/out a Car Pool x 3 hrs (1/2 hr each way for driving + 2 hrs of practice time). Total Time Spent In Gym - Steve kept track of when each family shared a car pool and when each family drove the car pool by themselves. When a car pool was shared, each family in that drive spent 1 hour (1/2 hour there and back) of their time driving. When a car pool was not shared, that family spent 3 hours (1/2 hour each way for driving + 2 hours of practice time in the gym) of their time driving. These are recorded in full 24 hour days. Total Time Saved - Total Time Without a Car Pool - Total Time Spent in Gym. The car pool saved 3+ months of time not being in the gym or in their cars! For more junior volleyball education click here.